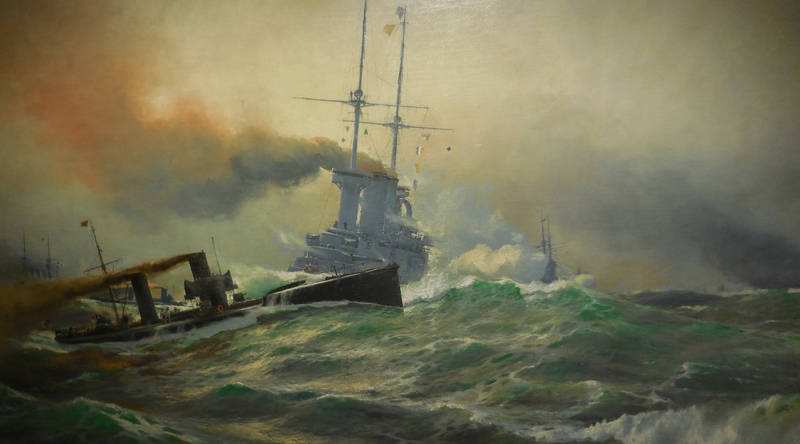 Sometimes the feeling of Jutland was captured even more in painting. There was no film footage taken during the battle by either side and there exists now surprisingly few photographs as well. Partly it was policy. Jellicoe himself did not like journalists around the ships of the Grand Fleet. He was always worried about security concerns. Wilcox came from a working class background. He’d won an early scholarship and when the war came, he joined up in the Navy where his skills were soon recognized and he was sent to help with naval camouflage. 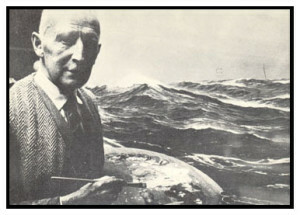 Bohrdt fell in love with the sea from an early age. 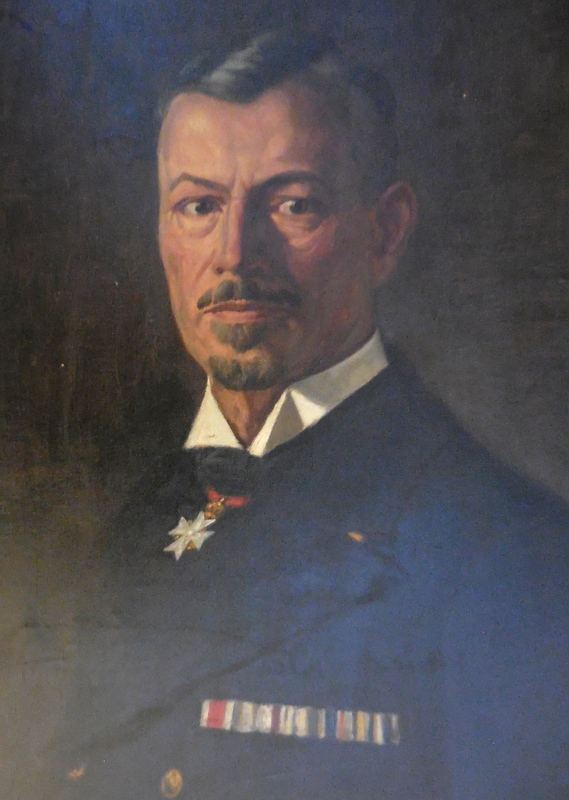 His painting was helped by the support given to him by Kaiser Wilhelm II who had him accompany him on several trips. He is best knwon, probably, for the propagandist feeling of his paintings, exemplified by « The Last Man ». The Munich based painter’s sense of realism comes from the fact that he spent much time with both Hipper’s Scouting forces as well as with the submarine forces. 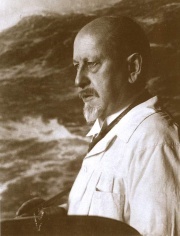 Bergen’s early association with the Nazi party and the praise he received from Hitler should not detract from the quality of his work. 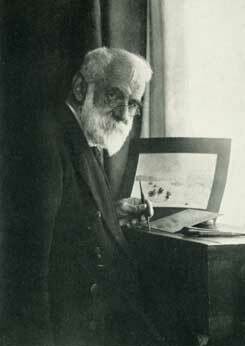 Whyllie’s father and brother were painters and he is seen as probably the leading maritime painter of the period. 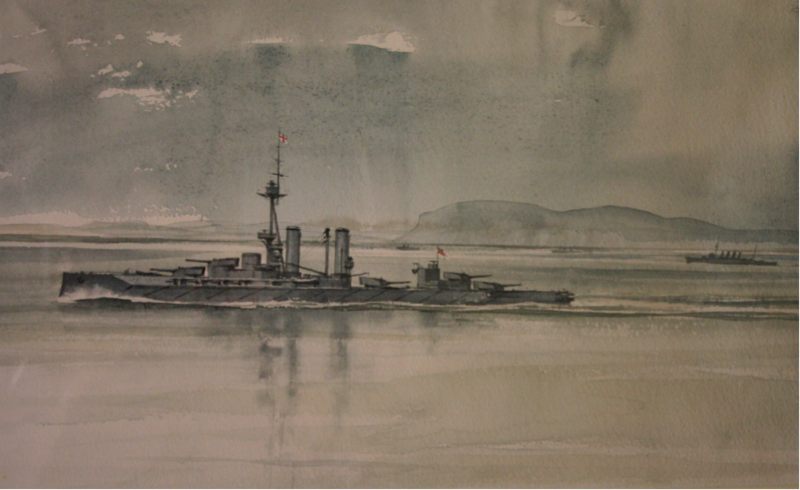 His subjects were broad – from Trafalgar to Jutland and to maritime subjects on the Thames. 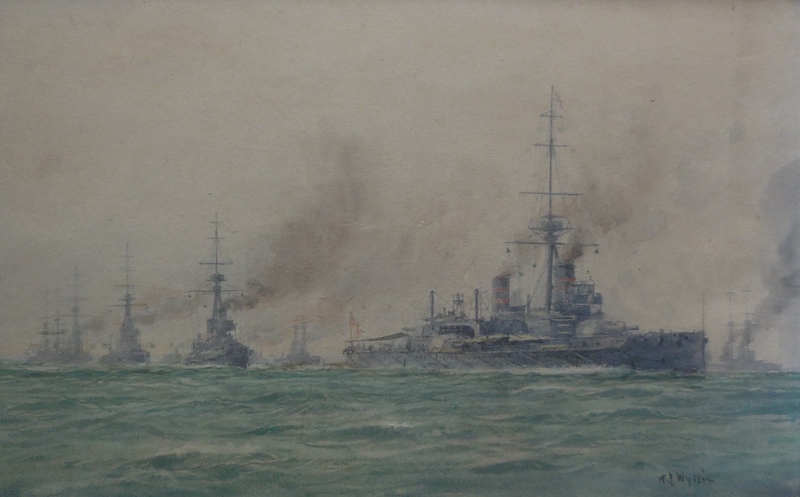 Whyllie’s painting shows the situation at Jutland at approximately 18.33 on 31 May 1916. 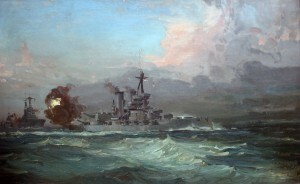 Admiral Jellicoe’s flagship Iron Duke is firing to starboard at the German battleship König. She is followed in the line by the Royal Oak, Superb, Canada, Colossus, Collingwood, Neptune and St Vincent. The vessel listing on the left is probably the destroyer Acasta of the 4th Destroyer Flotilla: she had made an unsuccessful torpedo run against the Lützow and was hit by an enemy shell in the engine room which killed five men and disabled her. 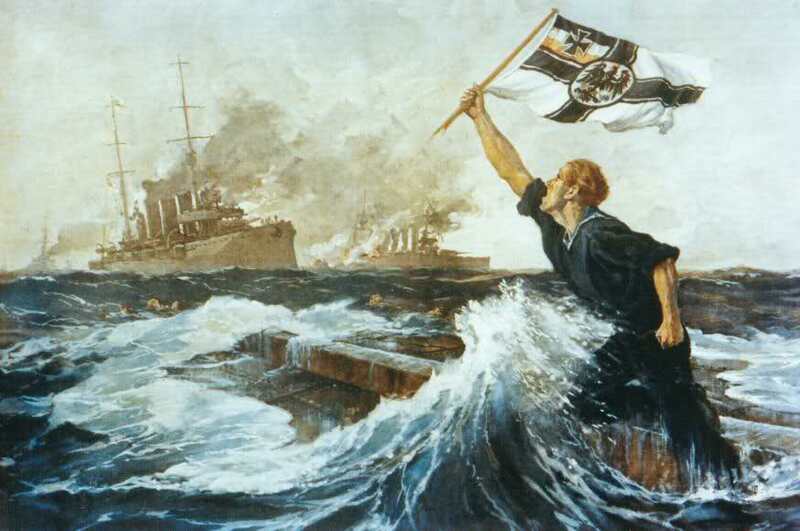 As she drifted into the path of the advancing British battleships her men lined the rails and cheered the Iron Duke as Jellicoe passed: she was later taken under tow into Aberdeen, repaired and eventually scrapped in 1921. The four-funnelled vessel on the right is the flotilla leader Kempenfelt, leading the 11th Destroyer Flotilla. This is part of now popular series of studies Whyllie completed on Jutland. It is from the deck of HMS Orion and shows her being followed by Monarch, Conquerer,Thunderer, the Third Division (of which Iron Duke was part and can be seen on the left). HMS Hercules at a pre-war fleet review. Again, the painting is by Whyllie who seems to have had a special interest in the ship. Like Iron Duke he did quite a number of paintings on this particular ship. An interesting point here is that the foremast is behind the funnel. Spotting needs later called for a re-positioning asfunnel smoke and heat made it intolerably hot but also interfered directly with the effectiveness of Director spotting. 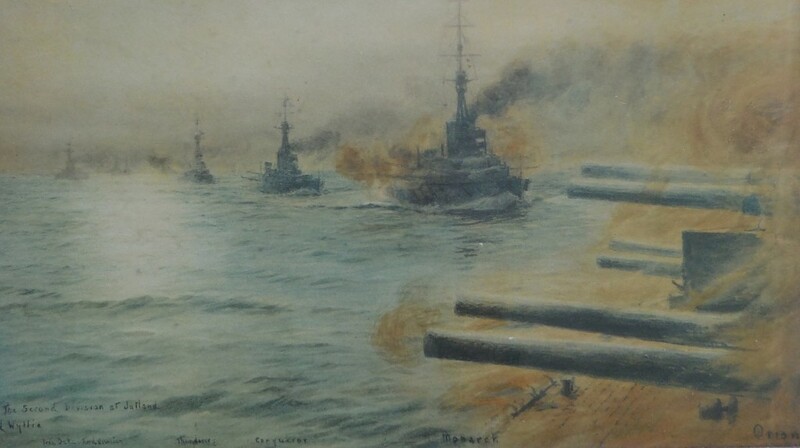 Iron Duke opening fire at Jutland. This one is by Leslie Arthur Wilcox but does not have the same drama as the Whyllie. Neither of them, however, come close to what the weather conditions were more likely to have been. 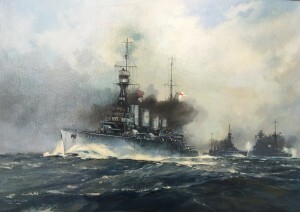 The Deployment at the Battle of Jutland, 31st May 1916. HMS Iron Duke, Royal Oak, Superb, and Canada following the deployment (Author’s Collection). This photo gives a better idea of the low visibility just after 18:00. (Imperial War Museum, Q 20439. Part of the Commander D Faviell Collection). HMS Iron Duke at Scapa. The artist is unknown. A wonderful moment when the signal Z is hoisted for the destroyers to Attack. « Stander Z ». 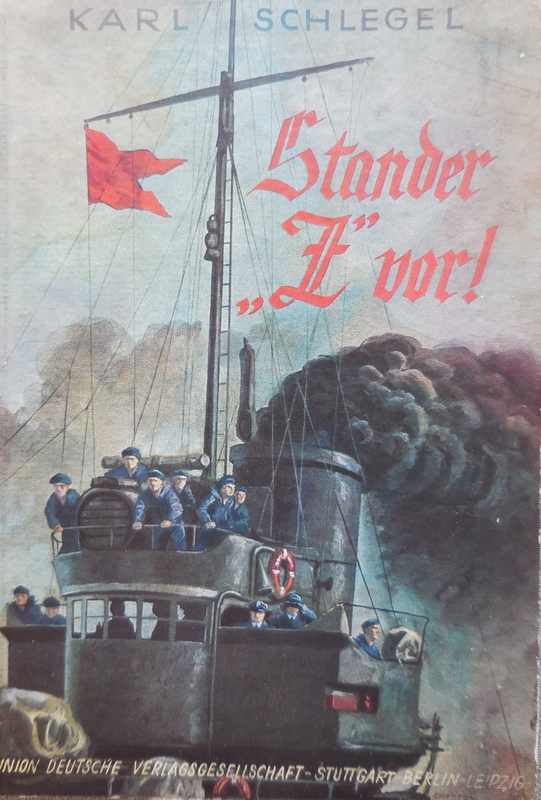 The dramatic “Torpedoboote im Manöver”( Torpedo Boats on Manoeuvre) by Willy Stoewer (© 2016, ProLiterris, Zürich) can be seen in the Hamburg International Maritime Museum’s collection which was put together over many years by Peter Tamm. The hoist as depicted on the cover of Karl Schlegel’s 1930 book. One of the most marvellous paintings that was on display at the National Portrait Gallery earlier in 2015. 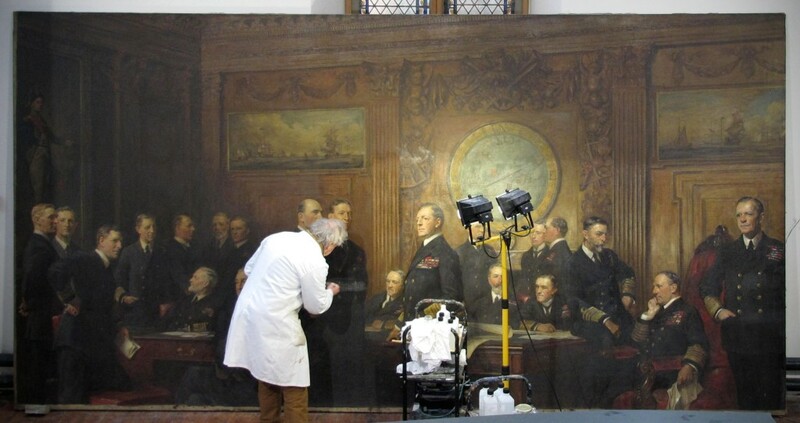 It is Sir Arthur Stockdale Cope’s 1921 entitled Some Senior Naval Officers of wrodl War One ». Beatty is center stage while Jellicoe is sitting, out of favour, on the right side. Madden has his back to Beatty (have a look on the blog for August 26th to see the list of Admirals included). Bohrdt’s propagand image are well known. It was seen and used widely and even used by Spiegel as the basis for a magazine cover. Before Cope put the various separate sittings together into his great work in 1921, he did numerous individual portraits of his subjects. 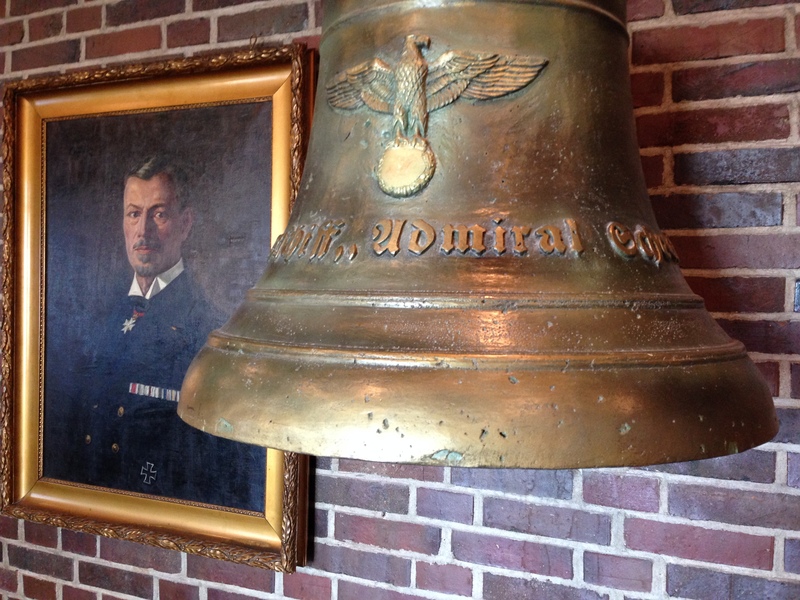 This is one (I believe of two) made of Admiral Jellicoe. These are both paintings of the Skagerrakschlacht that are by Claus Bergen and can be found at Laboe (© 2016, ProLiterris, Zürich), the site of the 1936 Naval Memorial. Bergen, I feel, made you feel as if you were in the battle itself. I find his work quite fascinating and very dramatic. HMS Southampton at Jutland. 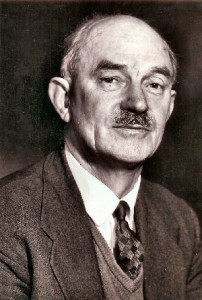 Frank H Mason 1876-1965. Private Collection. At 16:48 on 31st May 1916, one hour after the battle cruiser action had started, Commodore “Barge” Goodenough on HMS Southampton signalled back that he had 16 German dreadnoughts in sight. 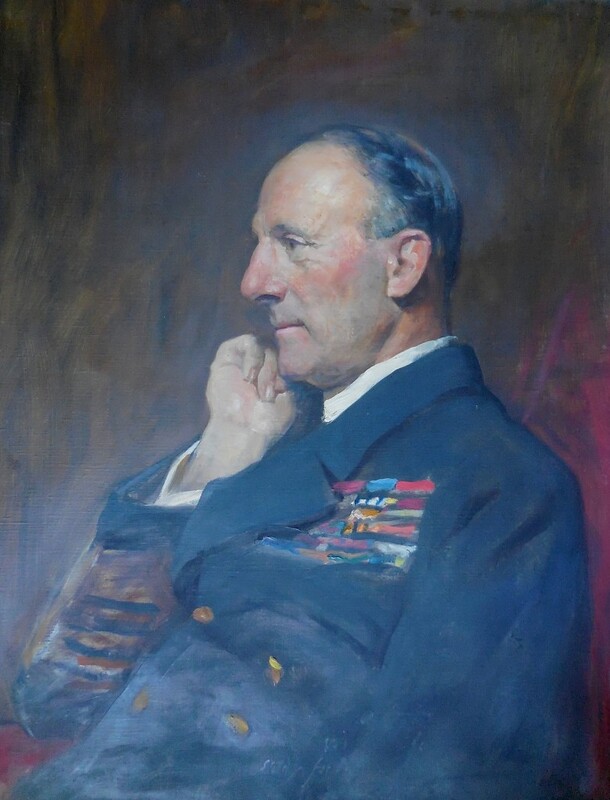 His warning signal allowed Vice Admiral Sir David Beatty to turn to the 1st and 2nd BCS around, later followed by Rear Admiral Evan Thomas’ 4 Queen Elizabeth class battleships of the 5th Battle Squadron and to lead Scheer and Hipper up north to the guns of Jellicoe’s Grand Fleet.